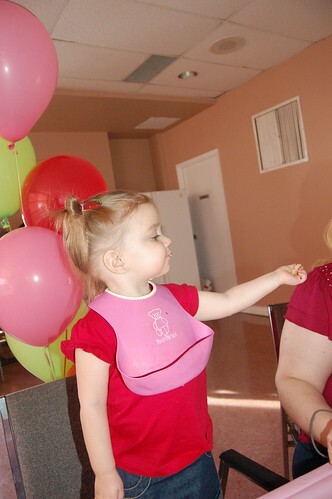 Our little Diva turned 2 back on January 20th and in celebration we decided to throw a party well fit for a little diva of course! 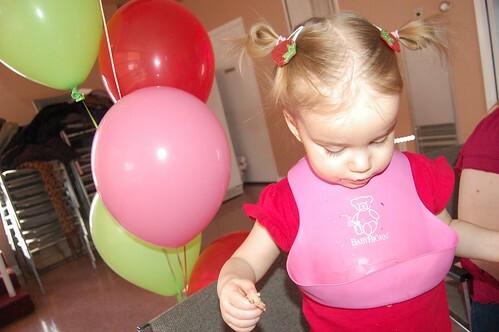 It wasn’t too difficult to come up with an idea for the theme since she fell in love with the a group of strawberry shortcake books her Nana has gotten her over the past two years. I really wanted to do a vintage Strawberry Shortcake party but I’m just not creative enough so I went with whatever I could find and in the end it was a fun set up with lots of great friends and family! 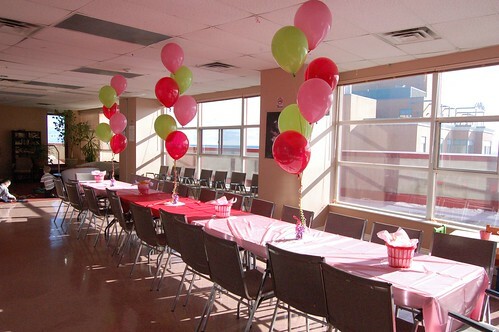 We rented out a roof top social room and did our best to turn it into a fun atmosphere perfect for a birthday party! 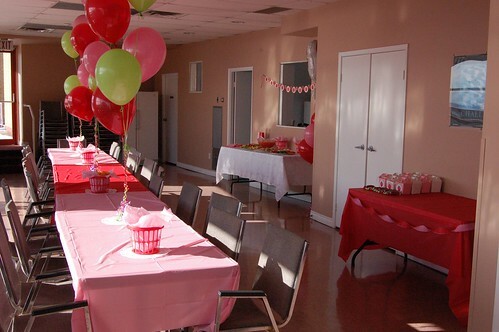 Here you see the guest tables all set up with pink and red tablecloths purchased from the dollar store and decorated with bunches of red, pink, and green balloons! 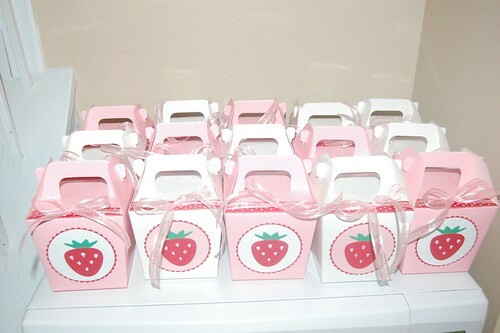 I found these little strawberry-esque baskets at the dollar store and lined them with pink tissue paper….they made perfect little baskets for chips and other party snacks! You’ll also notice I added some very in expensive (like 20 for a dollar) white paper doilies under the balloon bunches and chip baskets to give it a nice little elegant touch and add a splash of white! Here you can see the gift table/party favour table and the food table to the side! Again…everything was very inexpensive. We used another dollar store table-cloth on the gift/favor table and strung some pink and red streamers across the front! These were the homemade loot boxes that Violet’s Godmother and I created just for the event! Here you can see the food table! We covered the table with a white linen table-cloth and add some of the chip baskets plus a great big bowl of strawberry slush punch which was to die for! 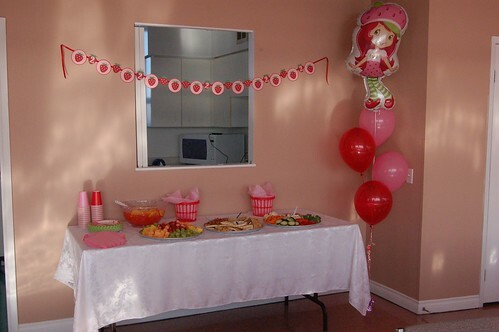 Our splurge purchases were the strawberry shortcake plates and foil balloon but we paired the plates with some solid pink and red cups and pink napkins that we purchased from the Walmart dollar party section…very inexpensive! 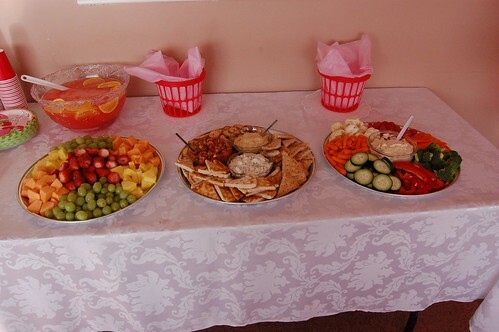 We kept the party food simple: veggies and dip, pita and dips (humus, bruschetta, and spinach), fruit tray, chips, pizza, and cake! The beautiful birthday banner was a homemade creation by Violet’s Godmother Suzanne based on the loot boxes that her and I came up with to give as party favors. Yummy birthday cake was enjoyed by all! 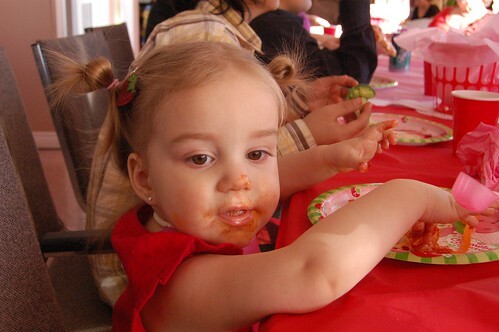 The birthday girl loved her pizza! It’s a favourite food of hers! 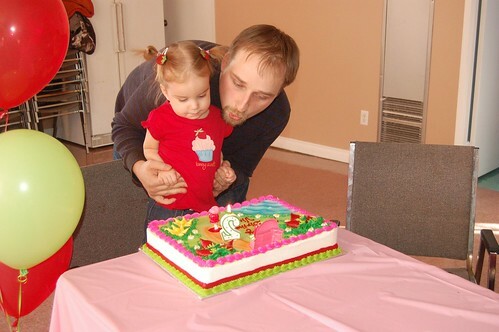 Together with Daddy the birthday girl worked hard to blow out the candles! Offered to share her chewed up cake with company…. I’ll spare you the “yes I know I haven’t blogged in a million years” explanation and just jump right into some of the happenings in our life. Jacob’s class is doing a reading readiness/encouragement program called Snuggle Up and Read which is in my opinion a Kindergarten version of what will later become primary school book reports. The idea of the plan is that the kids in the class will come home with two books a week and with their parents they will try to work through the books with them by encouraging them to read as much as they can and use phonics to sound out words…..if they struggle with the reading we can help get the kids to guess what the word might be based on the pictures of the story. Once the book is done the parents ask the child a series of “who, what, where, when, why and how” questions to help them with reading comprehension and then the child will try their best to copy the title of the book into the journal and draw a picture of their favourite part of the story. Jacob has been very excited about this ever since we signed the form saying that we wanted to participate and let me tell you he got right to work when he got home on Friday and did all of the homework he had in a matter of 24 hours when it didn’t need to be brought back to school until this coming Thursday. The books as we expected they might be were a little too easy for Jacob but regardless we enjoyed our time snuggling up to read together and the journalling that took place afterward….Jacob even added a sentence to the bottom of his pictures about his favourite part in each book. 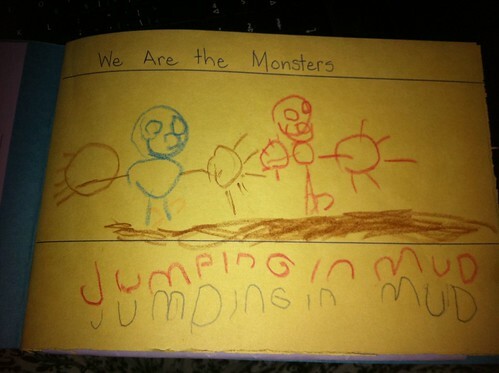 Here are his journal entries that he completed in his book….the first one was done at school and the second two here at home after reading the books with Mommy and Daddy. 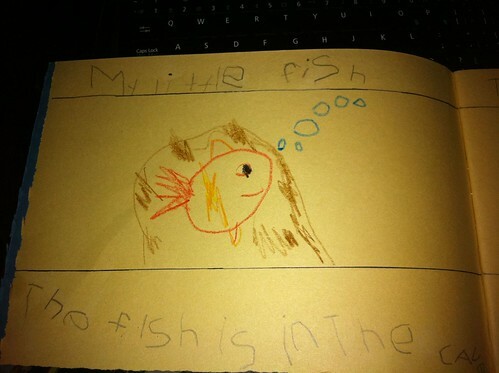 Favourite Part: The fish is in the cave. 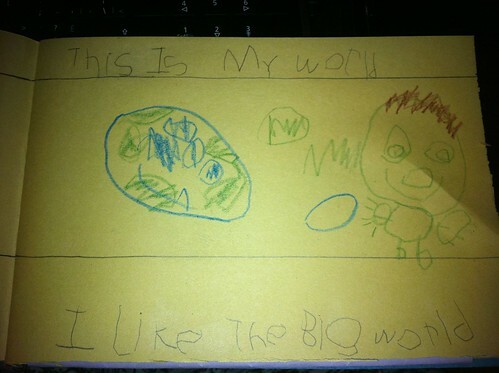 Favourite Part: I like the big world. I just love watching Jacob’s little mind work and unfold as he grows and as a person who loved reading and doing book reports as a child this activity is really just so much fun!! I am not lying when I say that Christmas is my most favourite time of year…it belongs to me and always has because I enjoy it so much and wish that the general good spirit and well wishes of all people could last all through the year – I am not naive to believe that it ever could. I constantly crave to “go all out” for my kids and create the wonderful spirit of Christmas that was created for me when I was a small child. Growing up I didn’t come from a wealthy family and we didn’t have the fanciest things but Christmas no matter what was always a fun time…always cherished, forever enjoyed….somehow Mom always came through and our house was always decorated perfectly – the happiest memories of my child hood are built from memories given to me by my mother during the holidays. When I think about Christmas and what it means for my family now…I still feel as if I’ve got a lot of sorting out to do. Many of the things I enjoyed doing with Jacob when he was smaller are eliminated because Violet’s allergies prevent us from participating (the Santa Train for example). In past years I’ve planned out fun activities to do with the family and it’s always gone well but this year I decided to be a little less organized and just let Christmas unfold as it does…whatever that may be. I’ve had a lot of time off work recently thanks in part to all the overtime I worked in October and you’d think that I’d have used the numerous days off in December to do all the super Christmas related things I had hoped to accomplish but I’ve been sicker over the past 6 days than I have been in a long time. All of the hard work I put in during the weeks leading up too now to prepare my house for Christmas has slowly started to disappear – toys from my children scatter the living room and the laundry pile grows but perhaps the worst part for me is that my Christmas tree has no decorations…. I’ve been so sick with a nasty sinus infection and some kind of virus that is attacking my body (making me run fevers and feel totally exhausted) and because of that the house grows messy and the tree stays undecorated; my husband although he tries to help out is not a very good multi tasker and taking care of the kids while I rest and keeping up with housework just seems to be too much for him to manage all at the same time…..so the tree remains there….an empty slate. I’ve tried to get my son excited about decorating the tree but he’s just not that interested and my daughter would rather eat the ornaments than do anything remotely tree like with them….so the responsibility as always falls back on me – the lover of Christmas. 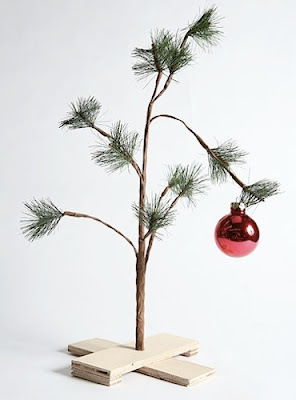 I woke up this morning with a desire to “get er done” but as I look around my house at the ever-growing “to-do” list…the tree just seems to be low on the priority list and that makes me sad….the undecorated tree makes me depressed. I have managed to wrap all of the presents I bought for my children which is a big task for me since I typically wrap presents on Christmas Eve after they have gone to bed and I’m really excited about the choices we’ve made for them this year. 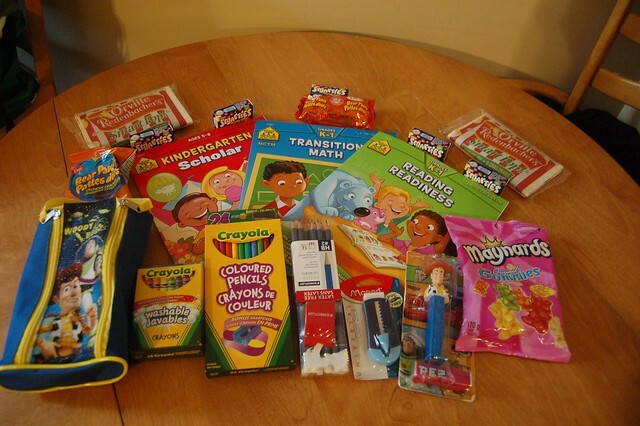 I very rarely buy toys for my Children unless it is their Birthday or Christmas so yes I do “go a little overboard” on Christmas but as with all things I have known many people who would see what we have for our children as frugal and others who would think that they were “spoiled”…..for the record I do not see my children as spoiled…..they do not get what they want when they want it and understand and follow through (although sometimes reluctantly) with the word “no”….I confidently think that we are “middle of the road” in regards to what we decide to get for our children and this year I’m happy that most of our gifts were thought out and planned rather than spur of the moments during a toy sale at Walmart. I guess aside from the Christmas tree woes I feel most down in the dumps about my lack of ability to give the gifts I’d love to give to the other people we love in our life – this year of all years there is just no budget because Mike and I chose personal health and well-being above everything else in 2010 and that has left the bank feeling a little strapped at times between his weight watchers, my jenny craig, and our duel gym memberships – all things we do not regret but it did take huge amounts of money from our budget…..we just can’t over extend ourselves during the holidays and “make up for it in the new year” so we vowed not to touch a single credit card for shopping this year. I made a list for my children and nieces and stuck to the budget pretty religiously….I feel happy about that and most importantly though there are not fabulous gifts for all the adults in our lives I’m happy to be spending unique time with each of them – enjoying each other as Christmas was meant to be enjoyed. We have big plans for ourselves in 2011…..so it’s a matter of getting through this holiday and connecting to the spirit of giving and family that I’ve always enjoyed through the years – I look forward to seeing the magic in the eyes of my children on Christmas morning, watching Sofia, Jacob, Violet & Gabriella decorating the gingerbread house this coming weekend, lasagna at my dad’s house on Christmas eve, Jacob’s school concert this Thursday, having Victoria join us for Christmas morning present opening and brunch, Christmas day and dinner at my mom’s house, cookies and milk for Santa Claus…..and YES…when we get to it….I look forward to decorating the tree and sitting back to admire it on a quiet night with my husband…. The housework will get done and the laundry pile will grow smaller with effort….It’s just about realizing that the Christmas spirit is always present even with all of the rush of life around me. It’s that time of year again folks! I dare not say it before my American friends have their Thanksgiving but seriously dudes I am totally feeling some Christmas spirit this year! What strikes me as so odd about my feelings this year are that we don’t have any of our typical plans in comparison to previous years. This year for example, we don’t have tickets to the Santa Experience an event that we’ve attended ever since Jacob was born…no real reason aside from missing the registration and them being sold out of tickets when we tried to get ours. In previous years we’ve attended the Toronto Santa Claus parade which is a huge day long event that we’ve grown to love but this year we accidentally booked our appointment for Portraits of the kids on the day of the parade….I guess that’s what happens when you have to book for Christmas Portraits way back in September due to high demand. Last year we took a ride on the Santa Train but the contaminated cookies they give out on the train and our knowledge of Violet’s allergies makes that a no-go for us this season…..yet here we are…completely stripped down from our usual happenings and I’m feeling totally enthralled by the thought. There is something insanely triumphant about the calm…..the ability to spontaneously stop by the big tree downtown and walk the streets with hot chocolate if we desire or the time to stop by a friend’s house just for the sake of visiting…it all truly permeates with goodness – like the season is meant to be experienced I think. I am nearly done all of my shopping for my children which astonishes me because I’m usually shopping right up to the last-minute. I’ve asked Nana and Papa to be on the lookout for a few items for Violet while they are in the USA next week and aside from getting Jacob a game or two for the leapster that he is asking Santa for…he’s pretty much done. Woohoo. The last thing on our list for the kids is a joint painting easel that we hope to pick up from Mastermind Toys when we get the chance to go out there and visit the store – that is if we decide to get it after all. I feel really great about the choices we made for both of our children this year and really happy with the choices of their grandmother’s also. My mom and her husband are getting the kids Pottery Barn Anywhere Chairs with their names Embroidered on them and they got Violet the Living Family Dollhouse and a V-Tech Reader for Jacob…so perfect. Mike’s mom picked out some fantastic presents that are also sure to delight the kids having picked up a new play kitchen for Violet and the Playmobil Schoolhouse for Jacob….seriously both sides of the family just chose incredibly well and were so thoughtful and generous. Once I’m done shopping for my children I’ll start to pick up gifts for other people and I’m happy to say my list is short this year….the bottom line is we just can’t manage to shop for a bajillion people anymore. I’ve already come up with a few little ideas for my nieces Sofia and Gabriella and I’m excited because this year we’re having that family foursome over for a nice Turkey dinner on the 18th of this month – a nice evening together which we don’t get to do enough…once again just planning on saturating ourselves with the spirit and meaning of Christmas. I’m not feeling too confident about when we’ll dig out the Christmas Tree but I imagine we’ll wait until after December 1st but definitely before we have company over for our little get together. I’m hoping to have ALL of my shopping done this year by the 15th of December but we’ll see how that goes….if I get time I plan to make our Christmas card again this year – here’s hoping. Some people have asked us what about clothing sizes for our chicklets this year…so if you’re curious here’s the details and these sizes are already taking into account room for growing! Jacob loves most things to do with numbers, letters, spelling, reading…..lego sets and beyblades. Violet loves anything super girly including dress up clothes/jewellery, strawberry shortcake, baby dolls, and of course story books always. Hope that has helped most of you that have inquired! Can’t wait for the Christmas Season to be upon us all! What can I say? 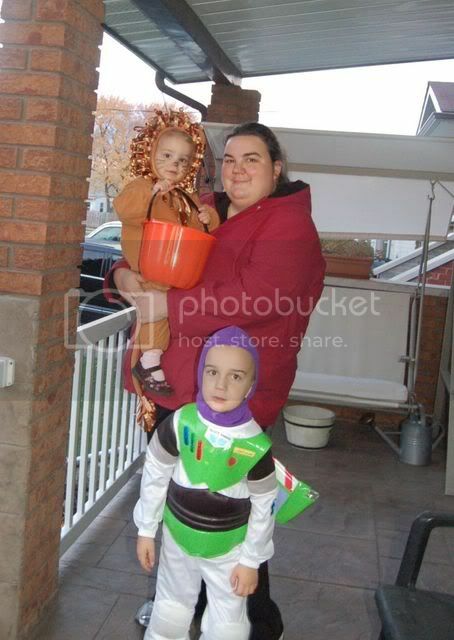 Both of my kids were insanely excited about trick or treating around town last night. I had my hesitations and anxiety about whether we’d be able to get Jacob into his costume since he refused to wear it to school on Friday and was pretty much the only child in his class not wearing a costume. 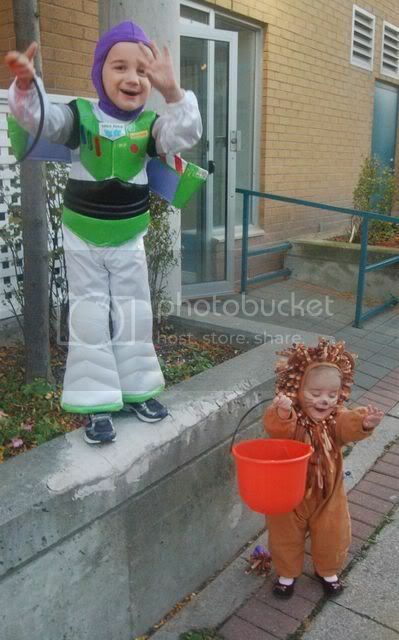 Needless to say there’s something about filling up a pumpkin bucket with candy that got him raring to go. Just hours before our departure Jacob proudly proclaimed that he would not stop trick or treating until he had 100 candies in his bucket and I, knowing my son all too well, envisioned pit stops with us sitting on the roadside counting out each candy until he had met his goal. Thankfully, it did not go down like that and I’m pretty sure that what ended up in his bucket was far more than 100 candies and I think he was sufficiently impressed with his “haul”. I haven’t seen a Halloween as cold as last night in years and sadly the frigid below zero temperatures forced Violet out of her cute lady bug costume because I could just not subject her to the tutu and tights she was supposed to wear. 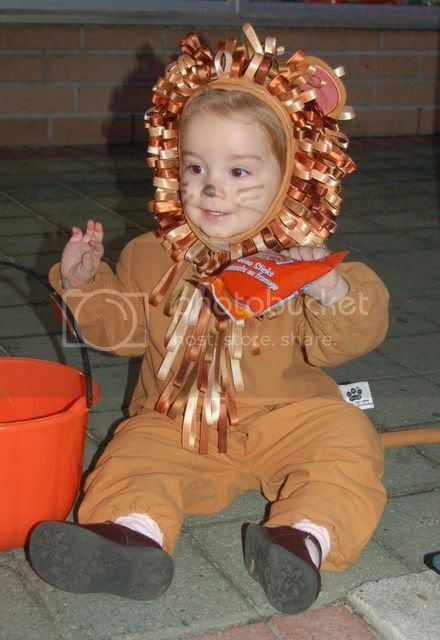 Luckily for us Jacob’s old lion costume (one of my personal favs of all time costumes to love) was ready to make an appearance and Violet proudly roared her way around our neighborhood…literally. It was a missed bag of tricks for our littlest creature because she being a few days behind in the cold that we’ve been sharing with each other was not feeling too fantastic. After about an hour outdoors going door to door she had had enough and we knowing it was well past her bedtime took her home for some rest…..well daddy did and I stayed out tormenting the neighborhood with Buzz Light Year. It was fun to watch Violet and quite curious to see her chose the times when she would thrust into her shyness and the times when she would becoming this outgoing little being we’ve yet to really see – she adored the thought of candies and chips being put into her bucket even though she had no idea exactly what she was getting….how I relish these days with my children. What more can I say about my 4 year old with the brain of an 8 year old that just continues to amaze me every day of the school year. After Violet went to bed I spent another hour outdoors with him and our friends Kara and Liam roaming the town in search of more edible goodness. 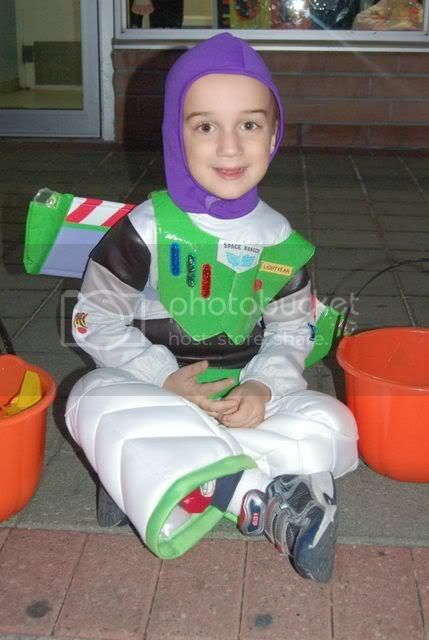 I found such joy in watching him run from doorstep to doorstep and chuckled quietly when I’d hear someone say “hey look it’ s Buzz Light Year” and Jacob would respond with “no it’s Jacob….i’m just wearing a costume”….that is my boy – totally. 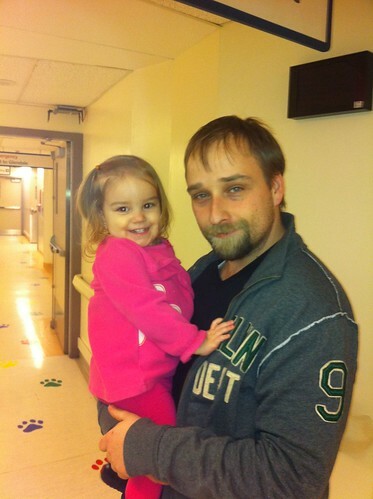 I was worried about his asthma and the lingering cough that has been bringing him down over the past week but it was a great night and we had so much fun together without daddy. When we got home, Jacob and I, we sat down and went through every single Candy in the great big bag and got rid of anything that contained peanuts or nuts or that had been manufactured in a facility that processed nuts or peanuts – it was our first Halloween managing Violet’s allergy and Jacob gave up his non-safe treats without even blinking his eye. 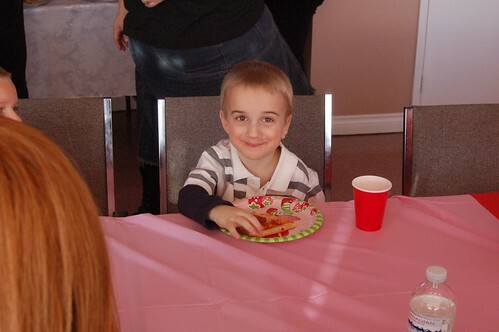 When all of the sorting was said and done…..we allowed Jacob to eat an unreasonably reasonable amount of candy, brushed his teeth and sent him off to bed. I have no issue with my kids going nuts and drowning themselves in treats on special holidays because we just don’t fill ourselves up with them on regular days…….and Jacob was very selective about what he did it anyway – all in all a great Halloween…can’t wait for next year. Having not been in Kindergarten for about a million years now (heh) it came as quite a shocker to me when Jacob was sent home from his Kindie class with a homework assignment that involved making a family newspaper using sentence strips as guides. The project came home on the very same Friday that we learned Jacob would be moving from the Junior Kindergarten class to the Senior Kindergarten class (more on that in the future) so we were not sure if the expectation was that he still complete he home work task but we wanted to complete it with him regardless. It was really great to watch him plan and think out the answers to the sentence strips and even greater to have a discussion about his views on his family! I’ve known for a really long time that Jacob was advanced in a lot of areas of academic intelligence but watching him go through the process of school has really begun to open my eyes to just how advanced he is in comparison to other students his age. I would not go as far as labelling him gifted but it’s obvious to use and to both his old teacher and new teacher that Jacob is very bright…doing this homework assignment really started getting me thinking about just how bright he really is. I had assumed that he would not be able to write out “play at the park” so I first wrote it out for him on the white strip of paper but he insisted that I didn’t need to do it for him and was actually kind of mad that I did do it…..so of course he did it himself below the strip and proved to both his father and I that he really doesn’t need our help with these projects….he also spelled out the word Cat and of course his name Jacob, he cut out all the white strips of paper and glued everything down before adding the stickers and writing the letters D (Daddy), M(Mommy), J (Jacob), and V(Violet) on each of the hands that we cut out together to represent our family! It was just so much fun to complete this project and I look forward to more homework projects in the future! 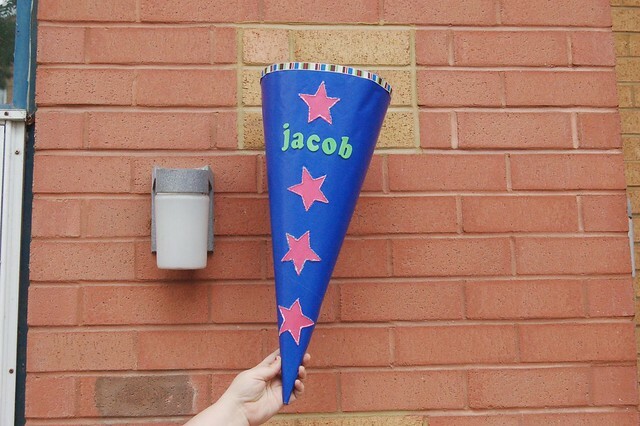 Monday was officially Jacob’s first day of Kindergarten and to kick off the celebration we celebrated with a Schultüte (German School Cone) in honour of Daddy’s half german heritage. It was first suggested to me by my mother-in-law and Mike’s cousin and when I heard about it I just thought it was such a great tradition! I’m an okay crafty person so I found some examples on-line and got to making our very own Schultüte!! Yesterday I got the opportunity to see a picture of my mother-in-law with hers many many years ago (I’m not saying exactly how many because she might not be too impressed if I did) and it was just so exciting to see a nice tradition carried out in our family too! To make ours I used a standard size piece of bristol board that I found at the dollar store and then after rolling it into a cone and using my glue gun to secure it together I covered it in simple blue wrapping paper and added some pizzazz in the form of paper stars, puffy letters, ribbon, and sparkle glue! 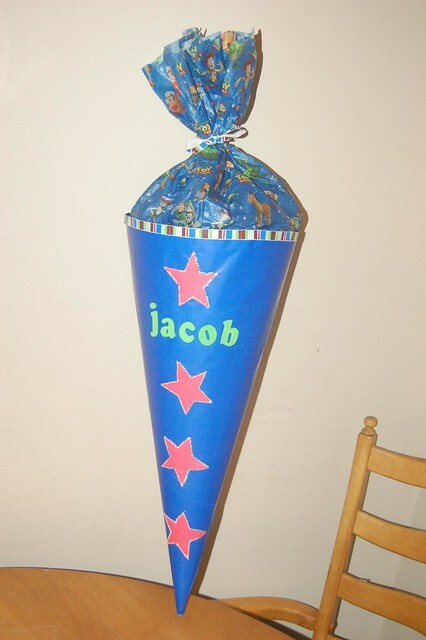 When I was satisfied with the design I had worked out I glued some tissue paper along the inside of the cone, filled it with the treats and school supplies, then tied it closed with a ribbon! 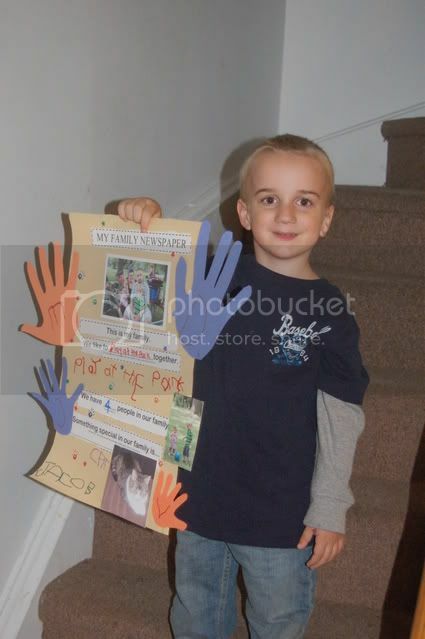 I think the end result turned out pretty great and Jacob sure loved it when we gave it to him! 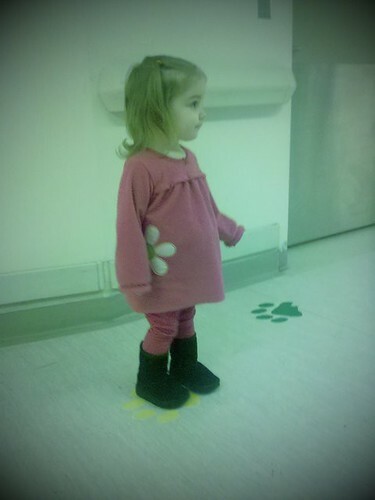 I can barely wait the three more years to make one for Violet when she starts school! All the little gifts for inside! 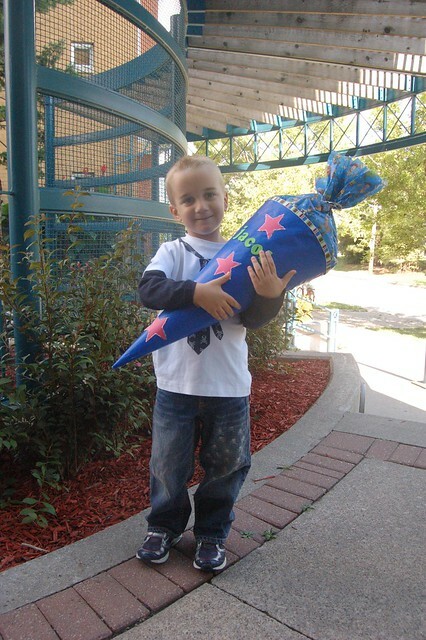 And finally some pics of The Dictator holding his cone on his first day of school! Yes, yes I’ve been slacking with my blogging efforts over the past little while because quite frankly I’ve just been working too much and not finding enough time to squeeze the blogging in too. 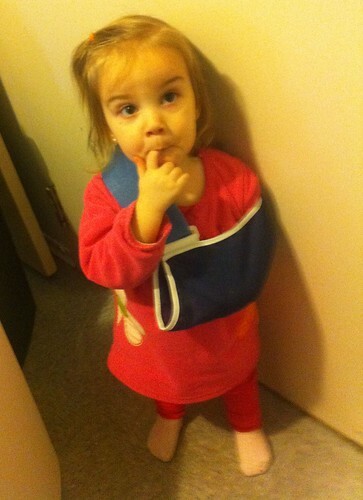 It seems that we’ve finally got some people at work hired so the possibility of picking up extra shifts will be slim. 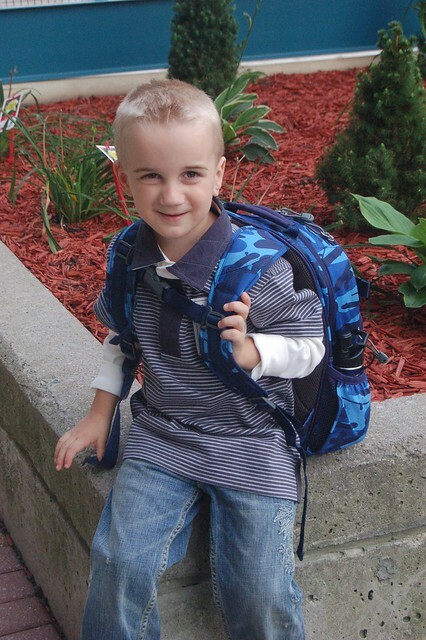 Last week was Jacob’s first orientation day of Kindergarten! Can you believe I’m saying that? KINDERGARTEN! Holla! In Canada kindergarten lasts for two years through the ages of four and five unlike the United States where typically kids start Kindergarten when they are 5 years old and everything else before that is considered preschool I think. Jacob has been enrolled in a Catholic School near our house and we feel pretty confident that we’ve made a great choice in this school for his first year….after Junior Kindergarten he’s likely going to a french immersion school but more details about that as the months pass on (let’s not get too far ahead of ourselves heh). When children are starting Junior Kindergarten the school does what they called a staggered start where the teacher spends time with the children in smaller groups getting to know them before bringing them all together – kind of like an orientation to school for them and an orientation to them for her…..make sense? Jacob has two kids that he knows in his class that’s he’s spent a significant amount of time playing with over his first four years and he’s pretty excited about that. Who am I kidding? 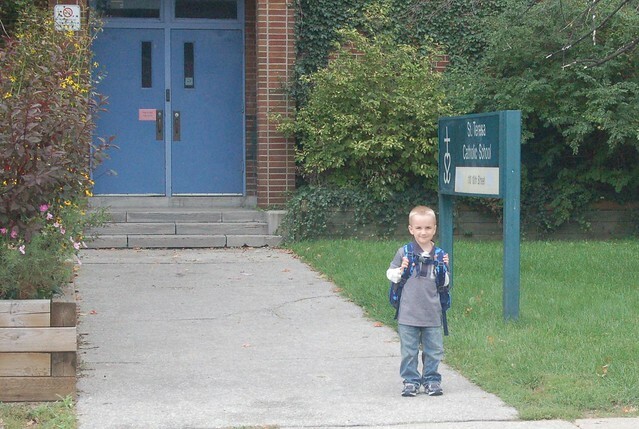 Jacob has been overly excited about going to school since he was two years old and I’m not surprised given his strength in intelligence, love of numbers and letters and genuinely strong interest in learning. I’ve never been one to say out loud that Jacob is gifted because I think every child is gifted each in their own way and ability but it’s more than obvious to us his parents and those who know him best that he’s smart as a whip when it comes to computing numbers, spelling and reading words, and his memory recall is superb – because of this I have anxiety and apprehension about sending him off to school for fear that he’ll become bored with re-learning the basics like his ABC’s which he’s known since he was 15 months old or how to count to 20 when he’s already doing basic addition and subtraction in mathematics and can count way past 100 counting by 1’s and 2’s. I want school to be an enriching experience for him but also an opportunity for him to learn about friendship and play and so many other things – gosh I just have so many hopes and I do my best not to have that come across as expectations for him – although to be fair I do have expectations that he be a good listener and be respectful at all times; I guess I’m worried that boredom from already knowing most of the curriculum will cause him to become disinterested, inattentive, and struggle with behaviour problems; only time will tell I guess. 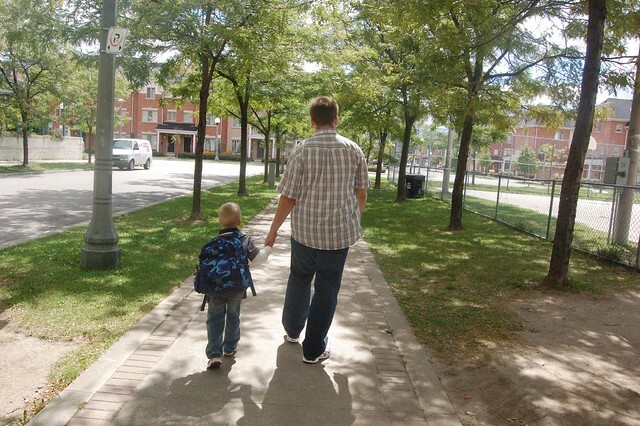 So as I was saying this past Wednesday was Jacob’s orientation day at school and while I was a bundle of nerves and excitement I think I handled it pretty well for a mother sending off her first-born child to school! We went in and did a little 20 minute intro with 5 other children and their parents and then we all waved goodbye to our four-year olds and took off out the door before they had a chance to cling to our legs crying for us to come back. In true Jacob fashion he was waving goodbye to us and telling us to hit the road before the teacher was even ready for us to leave so there was no separation anxiety on his part…maybe just a little bit on our parts. It felt really good to be able to go in there with Mike as a team…the both of us taking the time off we needed from work to support our child on his first day – growing up there were a lot of times my dad wasn’t there for special moments like that and it means a crazy amount of I dont’ even know what that my children have both their parents always present in their lives. We picked him up at 315pm sharp…the first parents to arrive and so he was the first child to come out of the classroom..he had a look of sheer happiness on his face and told us his day was fantastic! Gosh, I hope he continues to love school as time passes on. Ahhh there is so much to say about my darling Diva Violet and yet I find myself at a blogging loss for words about where to start. 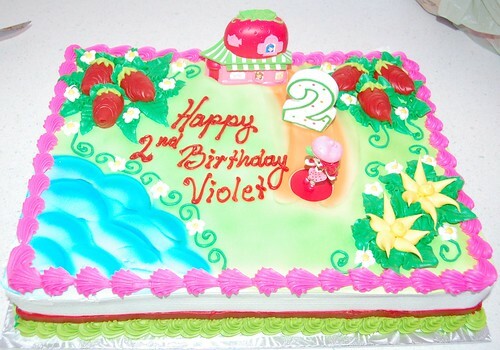 I have not written about my children in so long and so much has changed about them, especially my dear sweet Violet. I will start with some of the obvious things about here which will probably not come as a shock to most of you but I am still coming to terms with the fact that she is now 18 whole months old! 18 months! It feels totally impossible that she has been blessing my life for all this time and that before we know it we will be sounding the horn on her 2nd birthday! I have really enjoyed being her mother over the past year and a half and I rarely have many complaints about taking care of her because her personality is just packed full of so much punch. After having only Jacob for so long I never imagined that having a second child could be so different!! I pictured that although their personalities would differ slightly they would share many things in common and be alike in many ways but I could never say this about them now! Recently I was thinking about ways to describe Violet’s personality and it came to me one night as I thought about her that she is every single human emotion packed into one wee little body. I really can not think of a better way to describe her than that and if you met her you would agree that she experiences every emotion with such power….there is no denying when she is happy, mad, sad, excited, shy, coy, or afraid….and she does such a good job at communicating it to you through the expressions of her body and the tone of her voice. Violet is hilarious and spontaneous and so ver many wonderful things but I know that when someone feels their emotions so strongly it must also happen with the not so good feelings….I imagine through her life she will always experience sadness with such profound emotion and I can connect with her on this because I feel my emotions this way also. I think the best part of Violet’s personality right now is that she is so hilarious, so funny and every moment is one to be treasured! Lately she has taken to climbing the stairs to our second floor and when we approach to bring her down again she will smile proudly sit down upon a step, look up to us with her big beautiful brown eyes and he perfectly wide smile, and she will pat the spot next to her and say “sit Mama”. It is impossible in this moment to feel frustration about the fact that this is the 20th time in 2 hours that you have removed her from the stairs and it gets me thinking that if I was 18 months old I might also find it fun to spend my day going up and down the stairs – what fun right? When I think about this story I am reminded of her language development….it is something we have thought about often because after having Jacob who was talking in complete full sentences at just 15 months old we did not really have an idea of what is normal for Violet. I am happy to say that her language development is coming along perfectly well and while she is not talking to us in sentences and her number of words is not crazy high…she is learning by leaps and pounds every day and is starting to combine two and three words together – the inflections and tones in her voice is appropriate to situations and we are hearing her talking away in her toddler language in what sounds like real words sometimes…..I feel she is perfectly on track for where she should be. What else can I say about Violet? Everything about her is wonderfully girly and feminine and not something I ever imagined in my daughter but it has come naturally to her…despite all of the many “boy identified” or “gender neutral” toys in our house she is drawn to her babies most of all. In a room full of toys she is drawn to babies, dollies, purses, bracelets and shoes…..oooohhhh how this girl loves to carry around shoes! Who is this girl and is she really my daughter? It is obvious to both That Daddy Guy and I that Violet has a love for animals as she has really taken to our cat….something Jacob has never really shown much interest in ever AND we have spent countless minutes perched in front of windows at pet stores with her peering in at all the animals. Unlike Jacob who was slower in the development of his motor skills Violet has exceptional motor skills and can already hold a crayon or pencil perfectly and if you let her she will doodle away and draw on paper like crazy!!! Since she was just 9 months old she has been found to spontaneously break out at any given moment in a dance and there is just such glee and happiness on her face when she does do it….you can’t help but smile and dance along with her. 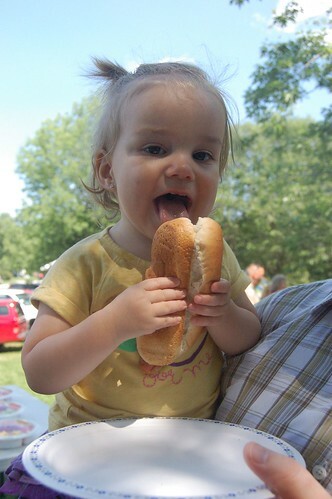 How I adore this girl….and how I want to drink in every minute of her youth! I imagine her playing a sport or doing dancing or maybe both…..she has such focus and determination and when we take her brother to hockey skating class she is trying with all of her might to get out on the ice! I see good things in her future! On the medical front Violet continues to be our healthier child of the two…..she is never catching colds and if she does they are usually just the sniffles for a day or so. 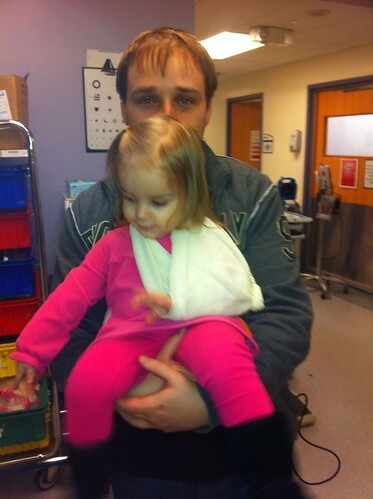 It is still hard for us with her allergies and it is ongoing education for us and for her. I still fear that some people in our lives do not take the allergy very serious but we really know that it is….we have seen the hives and how fast she is covered after just sitting in a high chair that was likely used by someone who had eaten peanuts or nuts…there is so much to consider and so much to remember – it is really a life saving conquest. At her 18 month appointment Violet weighed 21 pounds 9 ounces and was 31 inches tall…this put her at the 10th percentile for weight and the 30th percentile for height – we are not used to these percentiles as Jacob was busting off the charts in height at this age…..Violet is just little all around in comparison…but she definitely has a bit of toddler chub on her legs – I will be sad to see it go as she grows in the next year…..it always does. 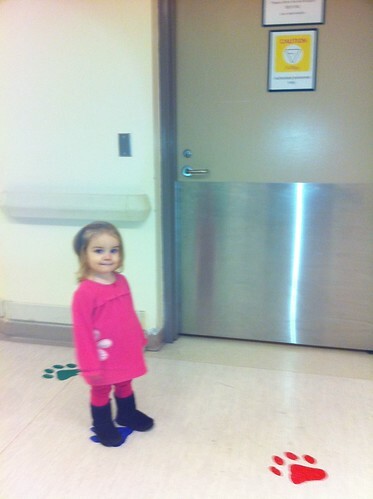 The doctor said she is doing wonderful and we should have nothing to worry about!! So this is it! 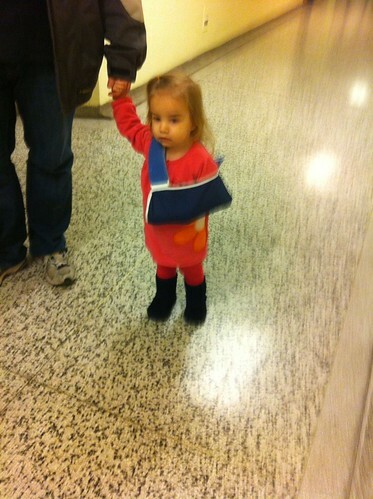 This is the update on my dear precious daughter! I could go on and on forever about how smart she is and how different her intelligence is from Jacobs, or about how shy and coy and wonderful she is but now that I’m back to blogging I need to save some of my stories for another time!